West Bengal Health Recruitment Board (WBHRB) has released the notification for recruiting the candidates to the post of Staff Nurse: Grade II. WBHRB will release the WBHRB West Bengal Staff Nurse Application Form 2018 on September 17, 2018 at www.wbhrb.in. The last to apply for WBHRB West Bengal Staff Nurse Event 2018 is September 29, 2018. Application Fee for WBHRB West Bengal Staff Nurse Application Form 2018 will be Rs 210/-. Candidate can only use the online payment gateway for making the fee payment. Before filling the Application Form candidate should read the eligibility criteria at first. From this page, the candidate will get the full update regarding WBHRB West Bengal Staff Nurse Application Form 2018. Application Fee will be Non- Refundable. The candidate who will full fill all the eligibility criteria that candidate will be considered for the further Recruitment process. From below candidate can see the WBHRB West Bengal Staff Nurse Application Form 2018 schedule. Application Form: Candidate will be able to register themselves from official website i.e. www.wbhrb.in. The few eligibility criteria details for WBHRB West Bengal Staff Nurse Event 2018 are given below. For viewing the detailed eligibility criteria for WBHRB West Bengal Staff Nurse Event 2018 click here. Age: Applicant should be between 18 to 39 years of age as on January 01, 2018. Educational Criteria: B.SC (Nursing) / GNM. Candidates should refer the documents because this helps the candidate to fill out the correct details or information in the Application Form. Before filling the Application Form candidate should refer the following Documents. 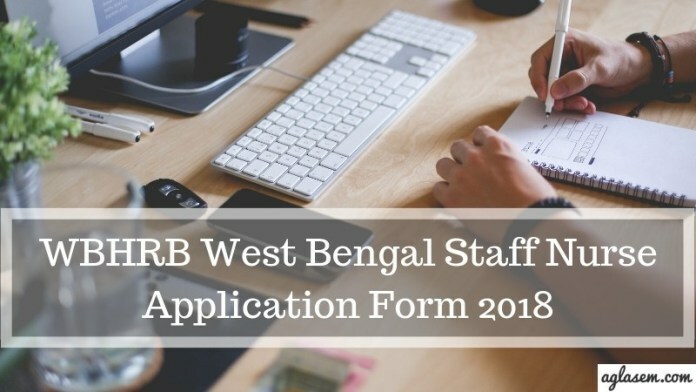 How To Fill WBHRB West Bengal Staff Nurse Application Form 2018? Candidate should keep in note that they should provide all the valid and correct details in the Application Form. If at any stage it is founded that the applicant has provided invalid details then he/she will be not considered for the further recruitment process. Candidate can follow the given below steps for filling the WBHRB West Bengal Staff Nurse Application Form 2018. Step 1: Click on the link provided above. Step 2: Click on the link in which WBHRB West Bengal Staff Nurse Application Form 2018 is mentioned. Step 3: Thereafter, the Application Form page will open. Fill all the asked details like- Personal details, Contact Details, Qualification Details, Educational Details and upload the photograph and Signature. Step 4: After filling all the details recheck the mentioned details and then click on the submit button. Step 5: After clicking on the submit button, the Payment page will open. Candidate make the Online Payment by using Credit Card, Debit Card, Internet Banking etc at Govt. Receipt Portal System. Note: Money Order, Cheque, Bank Draft, Cash etc. will not be acceptable.